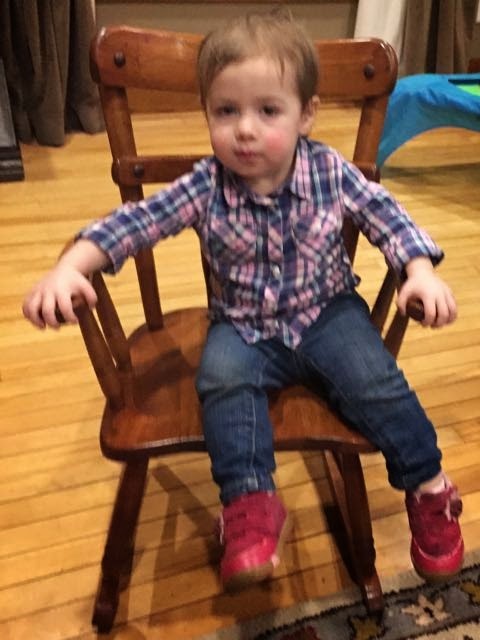 Our Christmas gift to Grand girl Lucy was my childhood rocking chair. A rocking chair that was a wreck when I discovered it in my mother's basement when we settled her estate. It was broken and missing pieces and when I brought it home I found someone who replicated the missing pieces and glued it all back together. And then it sat. In my basement. Awaiting. And finally, it came! It being Lucy. And this year, I reasoned, she was big enough to enjoy the chair! But the chair was not perfect, it needed help although it was whole again. And so, I asked my friend Shirley Ann if her husband Jack would refinish the chair for Lucy. He's a woodworker by hobby and has built furniture for their home, built their kitchen cabinets, refinished and replicated their grand stairway. My rocking chair, I reasoned, would be simple. And so he did and when I picked it up, I had tears in my eyes -- it was perfect. I looked like new! And Lucy loves it!!!! It is her chair! Jack, of course, wouldn't accept payment for his work. But there was a way that I could "pay" him! Last week, he and Shirley Ann came for dinner. A "Thank You Dinner" for all the hard work that he put into making my old chair perfect for Lucy! It was just the four of us, but it was a nice meal and so the dining room is the proper place for a thank you meal! When it's four of us at our oblong table, I always like to sit two by two. Much better and much closer than one on each side. 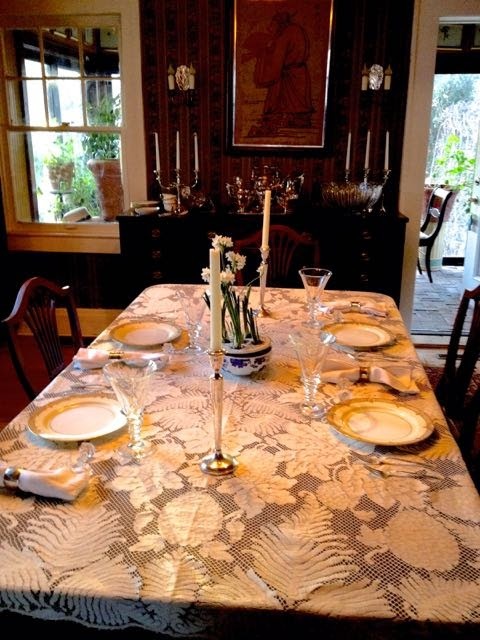 My Christmas present lace tablecloth that I adore. Candles in the silver candlesticks and the very last bowl of paperwhites as a centerpiece. An elegant table for a thank you meal for Friend Jack. Dinner? 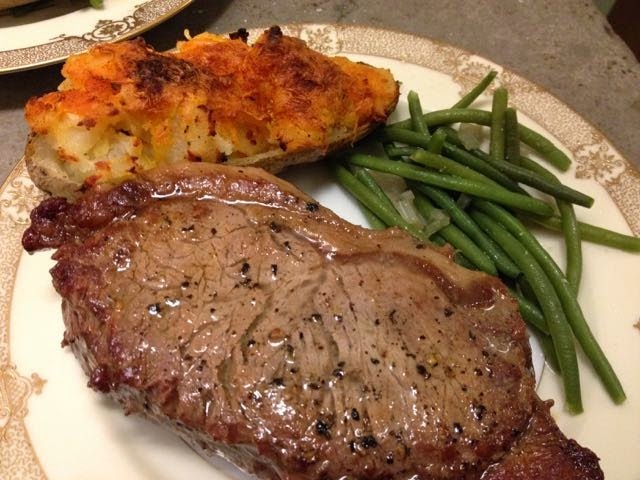 We started with crab tassies in the living room, then had a tossed green salad -- steak house style and the entree -- a big (and thick) Kansas City strip steak (cooked restaurant style), twice baked potato and green beans. It was a fun evening. 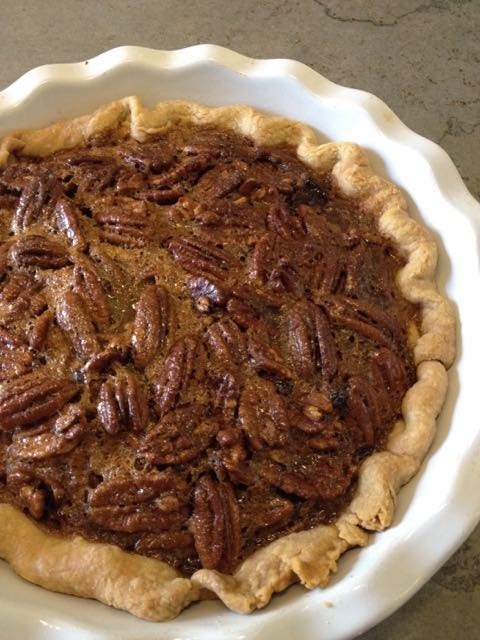 We had good food and I sent the rest of the pie home with Jack and Shirley Ann -- a final thank you. No Valentine's tables for Valentine's isn't until Saturday and I'm hosting my Valentine's Ladies Luncheon on Friday. It is Thursday and I'm joining Susan at Between Naps On the Porch for Tablescape Thursday. I love the passing-down of the rocking chair, and did something similar. My father refinished my childhood chair for our Lillypad, and it has now been passed down to her wee daughter. That thank you dinner looked delicious! Lucy does look perfect in that chair. I'm so glad she loves it. I love your tablecloth. I've admired it in every post where it has been pictured. The ferns in the pattern make it so beautiful, I think. And what a great menu for your thank you dinner. A real man's menu! So satisfying! 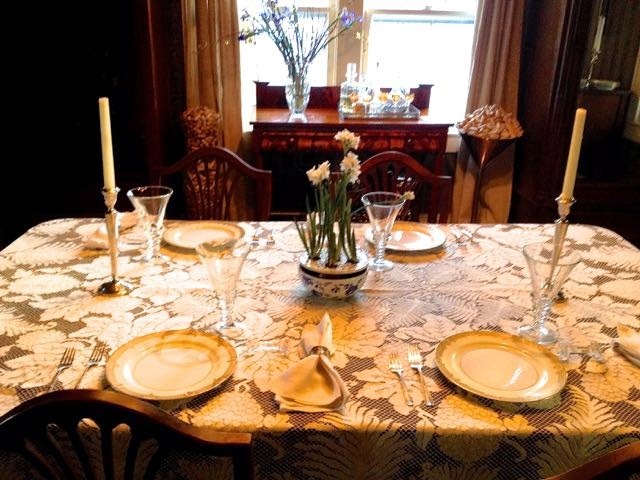 What a SWEET post - his help to make that chair "new" again, your wonderful dinner party for them as a thank you - just old fashioned honest-to-God niceties. Love it. 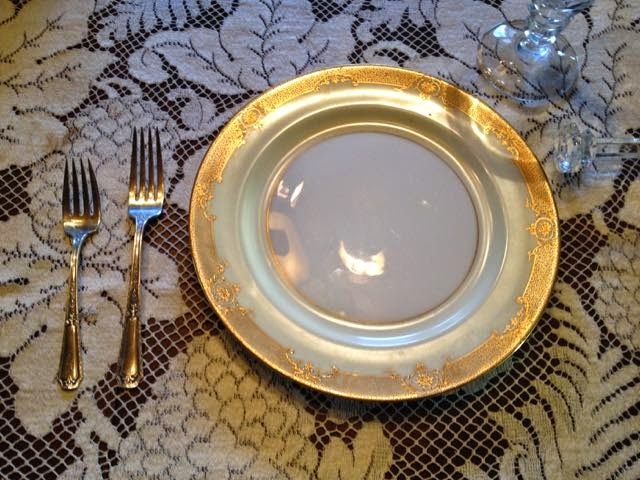 I have some extra large gold plastic dinner plate chargers - write me if you are interested. I think they'd look divine under those gorgeous Noritake china plates! That rocking chair is precious! Jack did a beautiful job fixing it up and that was a dinner much deserved. What a lovely treasure for Lucy! I know your friend and his wife were thrilled to be the guests of honor at your delicious dinner! Everything looked just beautiful! I can think of no better way to say thank you than preparing a meal for someone who did something special for you. That is the best kind of gift. Oh how sweet! It looks wonderful and I love that a friend could help you out with it. Your dinner for them was very gracious and looks so good! I love a good steak! This reminds me of a little rocking chair we have too. It was my husband's but his mother loved painting everything and I wanted it to look like wood again so he stripped it and we refinished it. Both our kids used it and now it awaits a grandchild! Have a nice Valentine's Day! Love your table and wishing for a steak right now!